The inside was dated…and needed a new kitchen, etc. It needed work and I wasn't up for taking on the challenge of fixing it up because I live in Portland Oregon and the cottage is in Gibsons, BC. It takes me 5.5 hours to drive to a ferry and then take a 40 minute ride to get to the area where the cottage is located. I don't mind all drive because it is worth it…however I wouldn't have been able to go as often as overseeing the work would have required. And then sold it to me on October 1, 2013. Over the next few posts I will be revealing the before (what it looked like in October 2012) and the after pics. The landscaping before…sorry about the quality...the pictures are screen shots off google. View blocked by a tree…note the driveway. Here is the tree that was blocking the view. Note the steps to the left of the tree. The pictures below show the landscaping the sellers put in between October 2012 and October 2013. They did a huge amount of work and put in a lot of money…more than I would have invested. I have a 500 square foot cottage and a 100 square foot bunk house/studio. The tree blocking the view is gone…new stairs and driveway. The Bunk House/Studio is the small building off to the right. View of the Pacific Ocean and islands. View of the ocean, ferry and mountains from bed. 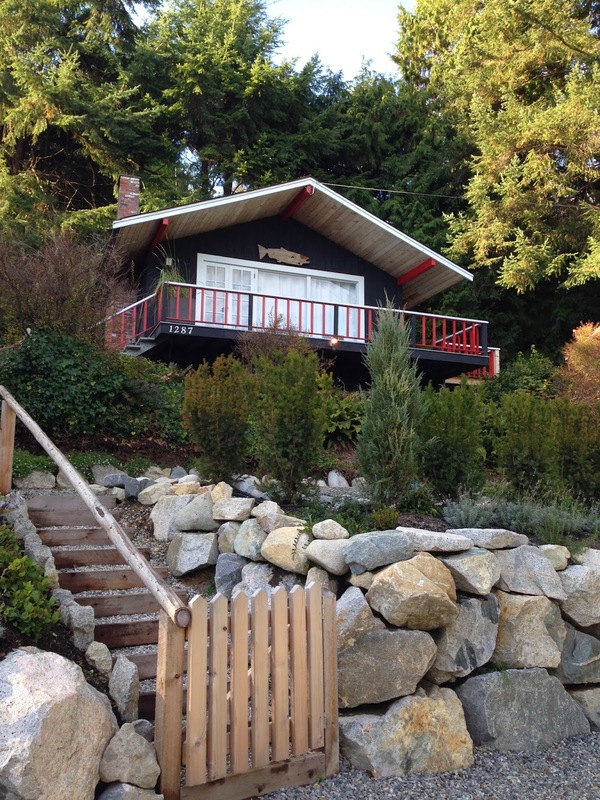 I have been so busy working on the dream cottage that I haven't had time to blog about it. I am in British Columbia at my cottage until January 5th…busy organizing, decorating, rearranging and cleaning, and even squeezing in time to go out dancing. Loving every minute of my time here. What will make the best experience for guests so they come back and tell all their friends? When I got to the cottage on Friday December 20th it had just snowed about 6 inches. Normally it only snows in the surrounding hills and mountains. What a beautiful site…it made me feel as if I was back in Minnesota. It was that wet heavy snow that drapes the trees. And of course my four-legged girl loved it. Since it normally doesn't snow I didn't have a snow shovel on hand…made due by using a gardening shovel. Over the next few weeks you will get to see the interior transformation. There is one change that has made a dramatic difference. The last time I truly blogged was 2010 and then I made one feeble attempt to start again in January 2013. The challenge in getting back to blogging was I didn't have anything to blog about...until NOW! And WOW I realize how boring my blog looks, especially compared to all the bloggers I started out with back in 2008. I guess a new look will have to be next on the blogging to-do list. Anyway…on to the reason I am back to blogging. 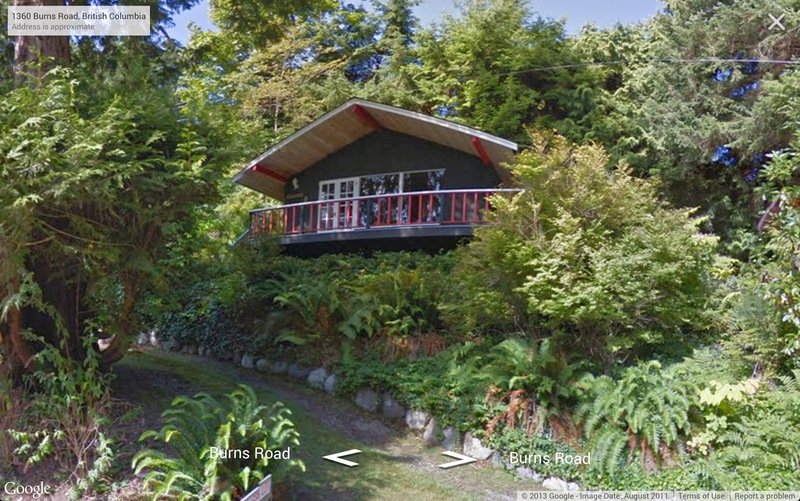 I bought a small cottage in British Columbia…a cottage that is only accessible via the ferry or sea plane. And when I say small…500 square feet. Over the next few weeks and months I will show you the inside and share my story. Oh, and it has a 100 square foot bunk house/studio…whatever one wishes to do with it. For me it will ultimately be a bunk house. It needs to be painted and decorated…however that won't happen until late Spring or early Summer. A view of the beach, ocean and mountains…this photo was taken from a friend's house. My view is good…not this grand…however I can walk 20 yards to the pier and see it all. Why I like it here! When you haven't blogged in over two years...how do you get back into blogging? First you spend a year regretting that you ever stopped blogging...then you spend the next year trying to figure out how to start blogging again...especially given that you have changed jobs, moved cities, sold a house and had the sellers back out on the house you wanted to buy -- the one that you packed your moving truck thinking you were moving into. I have been told you jump back in just like you jumped in way back before blogging was as big as it is today...(1) write, (2) edit a lot, (3) hit publish!